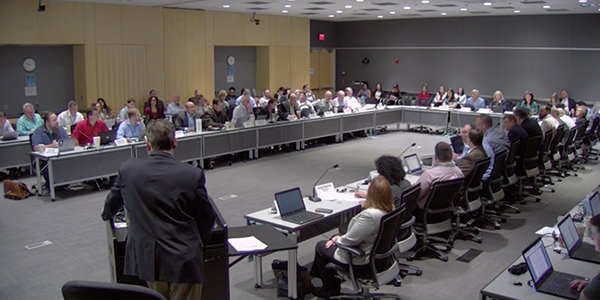 The ERCOT Technical Advisory Committee last week tabled a request to lower the grid operator’s peaker net margin (PNM) threshold pending further direction from the Public Utility Commission of Texas, which is debating the threshold’s continued existence. The PNM threshold is used to determine the point at which ERCOT’s systemwide offer cap is reset from the high limit of $9,000/MWh to the low cap (the greater of $2,000/MWh or 50 times the daily effective fuel index price). The ERCOT Protocols require the PNM threshold be set at three times the cost of new entry (CONE) for a power plant, historically a combustion turbine. The threshold has been $315,000/MW-year in recent years, but a Brattle Group report in December identified the latest CONE for a CT to be at $88,500/MW-year. ERCOT has proposed the PNM threshold be reduced to $265,500/MW-year, which is three times the recently determined CONE. “We’re taking something that came out of an academic exercise. This needs more vetting,” Reliant Energy Retail Services’ Bill Barnes said. ERCOT’s Dan Woodfin addresses the TAC at its March 27 meeting. The TAC endorsed the creation of a task force to establish market rules for implementing real-time co-optimization (RTC), which PUCT Chair DeAnn Walker hopes will bring “economic benefits that exceed its costs” and “operational benefits for ERCOT as well.” The PUC has directed ERCOT to proceed with RTC’s implementation (Project 48540). The Real-Time Co-optimization Task Force (RTCTF) will be led by ERCOT Compliance Director Matt Mereness and Bryan Sams, director of regulatory affairs for Lone Star Transmission. Mereness will serve as either chair or co-chair alongside Sams, depending on the task force’s determination. “It’s an honor to do this. It’s a big deal,” said Mereness, who promised up to three meetings a month. ERCOT has said it will take four or five years and about $40 million to implement RTC. The RTCTF will report directly to the TAC and comprise stakeholders and staff from ERCOT, the PUC, the Independent Market Monitor and Office of Public Utility Counsel. It will hold its first meeting April 4. ERCOT staff have said RTC will efficiently coordinate the provision of energy and ancillary services (AS) in the real-time market and price AS shortages according to their defined demand curves. ERCOT staff briefly reviewed a list of issues to be discussed during an April 23 workshop on energy storage. Staff are still gathering input on the workshop, which will also include a brief overview of an April 25 workshop on inverter-based resources. The TAC approved American Electric Power’s Jim Lee as chair and Just Energy’s Eric Blakey as vice chair of the Retail Market Subcommittee, which serves as a forum for resolving retail market issues directly affecting ERCOT and its Protocols. Lee and Blakey are exchanging the positions they held through much of 2018, maintaining the RMS’ unofficial practice of having a utility representative and a retail electric provider representative share the leadership positions. NPRR900: Addresses inconsistencies in the current Nodal Protocol language that don’t align with current processes, PUC rules and system design. NPRR906: Streamlines the Protocol language and removes ambiguity over how ERCOT systems handle the decision-making entity during security-constrained economic dispatch’s (SCED) mitigation processes. NPRR908: Aligns RMG references and updates mass transition notification requirements for emergency qualified scheduling entities to match with RMGRR159’s revisions. NPRR909: Resolves a gap in the Protocols by addressing the unplanned unavailability of emergency response service (ERS) loads and generators. NPRR916: Sets the mitigated offer floor to $0/MWh for “combined cycle” and “gas/oil steam and combustion turbine” resource categories, replacing the fuel index price-based calculation. The change also eliminates the grey-boxed language from NPRR664. NPRR920: Modifies the resource ramp rate logic in the Protocols (Section 6.5.7.2, Resource Limit Calculator) to dynamically adjust the amount of ramp rate reserved for regulation service in real time based on the percentage of regulation service being deployed in the opposite direction. RMGRR158: Codifies competitive retailer responsibilities during an extended unplanned system outage. RMGRR159: Clarifies the mass transition processes and communications by: shortening required minimum timelines for initial notification to affected parties from two hours to one hour; allowing preliminary notification of mass transition to affected transmission and distribution service providers, providers of last resort and PUC staff, as long as protected information is not disclosed; and clarifies that ERCOT may coordinate periodic testing of mass transition systems and processes with market participants. RRGRR020: Corrects certain submittal requirement fields inadvertently left blank during RRGRR007’s implementation by replicating requirements from the full interconnect study column to the planning model column for the affected rows. The request does not add any new data requirements to the glossary. SCR798: Introduces a limit on the total number of PTP obligation bids that can be submitted into the day-ahead market per qualified scheduling entity and per counter-party. The limit will apply to the number of bid IDs per operating day.